Setting aside bugs and bees for awhile, this summer I spent a great deal of time preparing a show for the Creamery Arts Center in Hotchkiss. Over the past two years, as Senior Outreach Coordinator for the non-profit artits’ cooperative, I have accomplished two things. Initially I set in place a rotation of Creamery volunteer artists to visit various senior centers and homes, coordinating with their respective activities directors, and bringing demonstrations and workshops to location bound seniors. Earlier this year, I gave up the coordinator position to another volunteer in order to pursue the second facet of the Creamery’s outreach program, honoring and showcasing some of the community’s senior citizens through art. 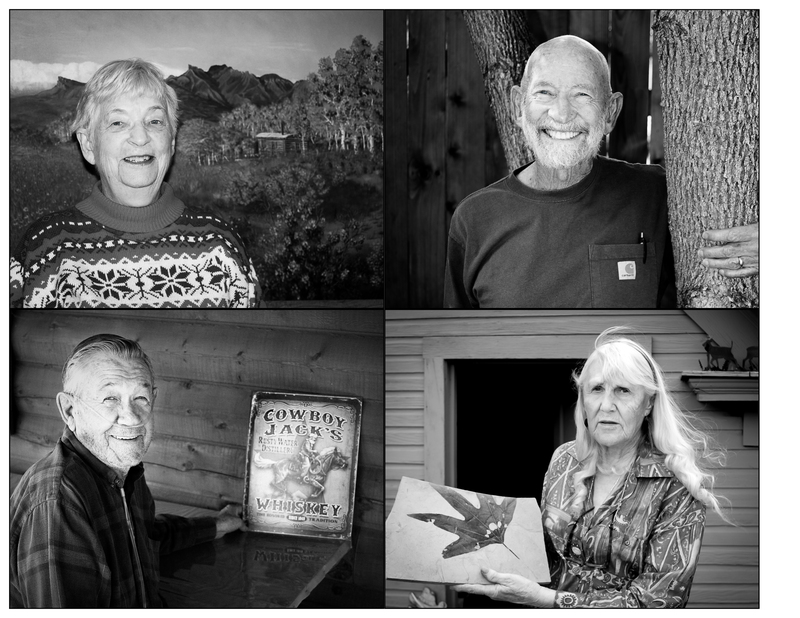 Now through October 7, the Creamery features an audio-visual installation, “Neighbors, Strangers, and Friends,” celebrating the rich history of the North Fork Valley through the voices of nineteen community elders, and their portraits by me! I had so much fun doing this project, and I want to thank everyone who consented to be interviewed, and everyone who helped and, especially North Fork Valley Heart and Soul for their support. A year and a half ago, I put the word out that I wanted to interview people over sixty-five who had lived in the valley all their lives or who had chosen to come to it later. At first I didn’t get a lot of response, and I also felt kind of awkward asking strangers to open up to me like that. It took awhile, but eventually one person would suggest another, who would suggest another, and so on. I enlisted a few friends. I heard a lot of wonderful stories. Everyone has stories that other people can enjoy and learn from. Sometimes it just takes someone wanting to hear them. We all have stories. Some of us have a lot of stories, and some of us have one defining story, but all of us have stories within the stories of our lives. I feel like I’ve helped some people to tell their stories. I hope they’re happy with the results. These people started out for me as neighbors, strangers, and friends. Today, I feel so honored that these women and men have entrusted their stories to me, and so grateful for their candor, their humor, their trust. I think of them all as friends, those I’ve known for 20 years, and those I recently met through this project. Each person who participated will receive their portrait from the display, and also a DVD of their video interview. A common refrain in the interviews was, “I wish I had asked mama (or dad, or grandmother…) about that.” Now the families of these elders will be able to learn from and celebrate them and their wisdom for years to come. Throughout human existence, elders have been revered for their wisdom, the insights that simply being human for a long time has given them. We’ve lost some of that reverence in our culture over the past half century or so. I’ve seen it go since I was little. Our parents and grandparents, aunts and uncles, neighbors and friends, when they get old, they sometimes get forgotten, and they have so much to offer those of us coming up after them, learning what it means to be human, which is a long, complicated endeavor; whether we follow in their footsteps or outside their boxes, our elders have a lot to keep giving to our community. Here, everywhere in our country, older people get forgotten in our culture. The wisdom and the being of people in their seventies, eighties, nineties, is such an important balance to the energy we focus on youth and doing. Our culture focuses too much on youthful beauty, on spending energy externally in getting and achieving. Please come to the show and join me in celebrating your friends and neighbors, none of them really strangers, just neighbors you haven’t yet met. Please ask your parents and grandparents, if you are still able, about your history, your own story. Please pay attention to your elders, all of them, your family, your neighbors, your friends. “Neighbors, Strangers, and Friends” is on display at the Creamery Arts Center, 165 West Bridge Street in Hotchkiss, Colorado. Summer hours are Monday – Saturday from 11 a.m. – 6 p.m.